Executives from the 12 biggest oilsands producers unite Thursday at the Hyatt Regency Calgary to announce the creation of the Canadian Oil Sands Innovation Alliance. The “overarching collaborative hub” was formed to share information and help advance research and technology to improve environmental practices. An unprecedented alliance of the oilsands’ biggest producers pledged Thursday to break down barriers keeping them from sharing environmental research and, ultimately, innovations in oilsands cleanup. 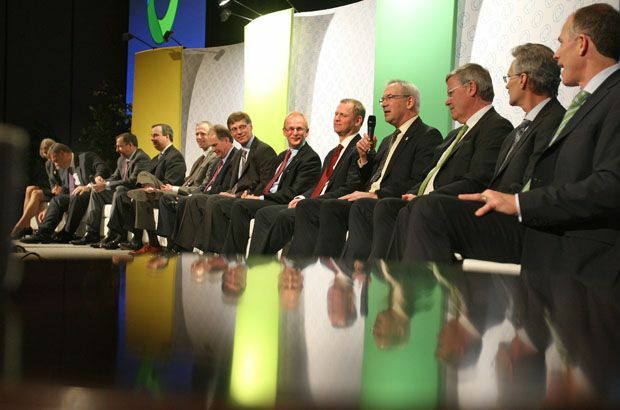 The leaders of 12 companies signed a charter that brought the Canadian Oil Sands Innovation Alliance to life with a collective commitment to focus on tailings ponds, greenhouse gas emissions, water and land issues. The “overarching collaborative hub” will not itself do research, or have a research budget, Wicklum said. Instead, the organization promised to help signatory companies work together and with smaller firms, governments and universities to develop environmental solutions. Essentially, the effort could result in sharing best practices. For example, companies that master winter replanting, dry tailings ponds or reducing carbon emissions would share that information with others. The alliance “is the right organization at the right time,” said Murray Edwards, vice-chairman of Canadian Natural Resources Ltd. While answering to the companies who have placed him in charge, Wicklum will also oversee that co-operation. “This can’t be a small, hidden type of agenda. It needs to be very transparent, and I expect that all of our products will be available on the web,” he said. Alberta and Ottawa last month said they would expand monitoring of the oilsands and increase air and water testing. Member companies include: BP Canada, Canadian National Resources Ltd., Cenovus Energy Inc., ConocoPhillips Co., Devon Corp., Imperial Oil, Nexen Inc., Shell Canada, Statoil, Suncor Energy; Total E&P Canada, and Teck Resources Ltd.
“Companies do realize that there’s a lot of benefit in working collectively on the environmental performance side,” said Travis Davies, a spokesman for the Canadian Association of Petroleum Producers. He suggested that other companies might join the founding companies. Ed Whittingham, executive director of the Alberta-based environment and energy solutions think-tank Pembina Institute, said Thursday the “magnitude” of the initiative could not be understated. Whittingham called the promise by “12 majors” a response to Canadians who want to see Alberta’s oilpatch “improve on business as usual.